Read about - Daintree Icecream Company below. The Daintree Ice Cream Company is definitely worth a stop when you drive along the Captain Cook Highway towards Cape Tribulation. This outlet is in a lovely setting with a large car parking area and plenty of shaded seating around the garden to enjoy your treat. We thought the ice cream was extremely good value with a tasting bowl of four flavours costing $6.50. When they are busy the varieties are a set combination and we thought this was a great idea as we tasted flavours we probably would not have chosen. Our tasting bowl consisted of Wattle Seed, Pineapple, Mango and Black Sapote (also known as black Persimmon or Chocolate Pudding Fruit) – all delicious. The Wattle Seed was my favourite. Remember to look around the gardens as we saw some amazing flowers - look carefully under the ginger plants. Lovely friendly service and after you enjoy your ice cream you can wander along the Orchard Walk and look at the plants that produce the fruit used to make these delicious ice creams. A printed guide is available form the front counter to help find the location of various plants (they also have labels placed at the base). I particularly enjoyed the poster on the wall saying “You can’t buy happiness but you can buy ice cream, and it is kind of the same thing” – so true with the Daintree Ice Cream. 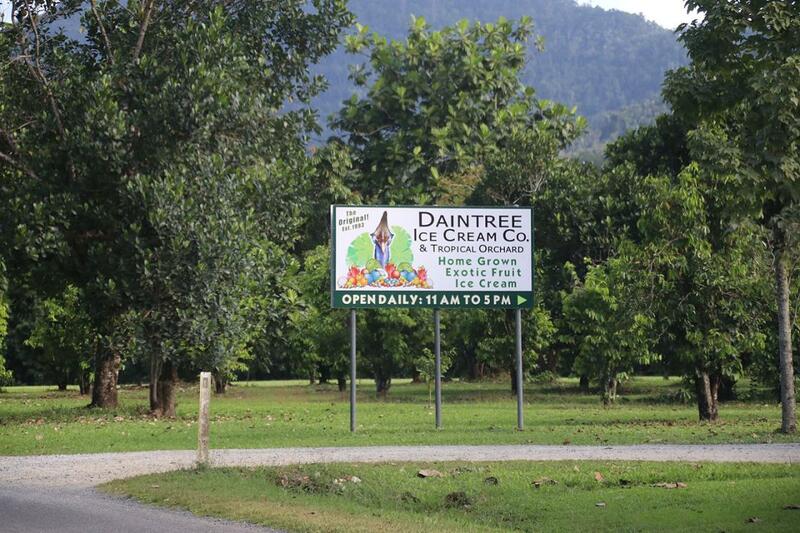 The Daintree Ice Cream Company is open daily from 11 am to 5 pm and is about 14 kilometres from the Daintree Ferry. have you been to Daintree Icecream Company? Explore Daintree Icecream Company with RvTrips and find out where to stay, what to do and what to see. Helping caravan, motorhome and camper owners have a great holiday.